There’s nothing better than pulling barrel proof bourbon out with a whiskey thief and filling your own glass. On Friday May 9th, Mafia member Dwight Thrailkill had the opportunity to join a group from Louisville for a Knob Creek Experience Barrel Selection at Jim Beam. The group led by Chris Schreck of Schreck Baxter Liquors and Rick Gribbins of Southern Wine & Spirits of Kentucky assembled in the Jim Beam Still House at the Clermont Distillery where they met Craig Weiter, Jim Beam Barrel Selection Manager. Craig shuttled us out to Warehouse K, built in 1943, where the barrel selection was being conducted. 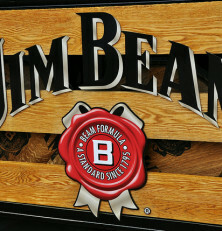 27 of Jim Beam’s 72 warehouses are located on property at the Clermont location. The other warehouses are at the Booker Noe Plant in Boston, KY and Old Grand Dad Plant in Frankfort, KY. Jim Beam uses three types of warehouses to age their 1.8 million barrels; Original 9 Story Warehouse, Escalator Warehouse and Palletize Warehouses. Three barrels were selected for us and waiting to be tapped. Different members of the group took turns knocking out the barrel bungs, thieving and filling everyone’s glasses and reseating the barrel bungs. Each member took their time and carefully made their choices with the unanimous decision going to barrel #3. One member enjoyed barrel #1 so much, he personally selected and paid for the barrel himself which will eventually be shipped to Hawaii. The bourbon selected will be bottled at 120 proof, non-chill filtered. Chris Weiter then gave us a tour of the distillery grounds, the distillery, different areas of the bottling house and went over the history of Jim Beam. Those that wanted to were able to run a bottle of Knob Creek through the wash, and send through the bottling line. After our barrel selection, a nice tour and a lot of laughs, Jim Beam treated us to lunch at Cattleman’s Roadhouse. A special thank you to Rick Gribbins, Chris Schreck and Kent Wernert for the invite and great experience.